Here are some cruise tips for your first embarkation day on a cruise ship. What to expect and what could happen onboard. You’ve been looking forward to your cruise for months and have been counting down the days, hours and minutes. The time has finally arrived and it’s embarkation day on the cruise ship, you’ve been dreaming of the cruise every night since booking. But the problem is there is too much to do and you’ve been bombarded with leaflet after leaflet promoting special deals for different departments around the ship. Some of the deals might be good but on your first day you really just want to settle in and only deal with the essentials. What to Do on Embarkation Day on a Cruise Ship? 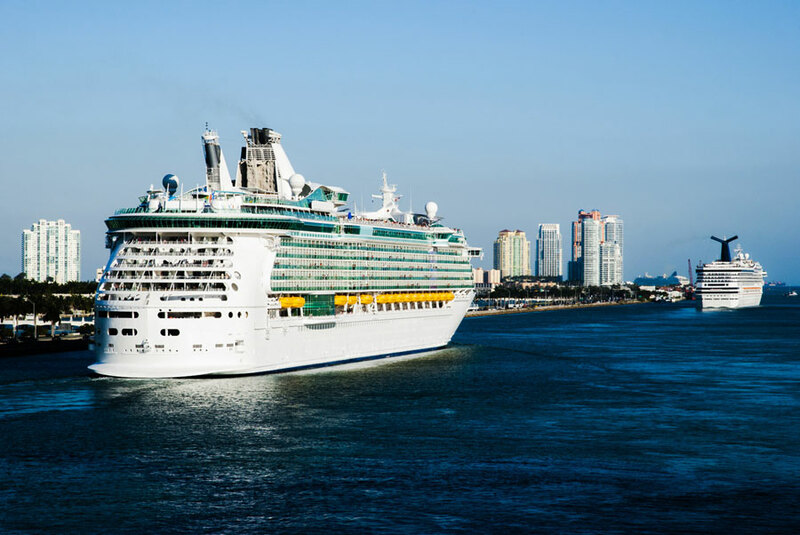 So let us take a look at how you can make your first day aboard your dream cruise the best it can be. Depending on the cruise line thee could be different events and offerings available on embarkation day. As the ship departs the cruise terminal the vacation will start and there are many things which can be done and need to be done. When you get onboard you won’t have your luggage yet so can’t relax in your stateroom. It’s best to head on up to one of the free dining venues or buffet to fill yourself up with all that tasty cruise ship food. This is a good idea especially if you’ve been traveling a long time to get to the cruise ship. Don’t eat too much though as you’ll want to feel good for the first evening of your cruise. Tip: Leave the specialty dining venues for your first full day at sea. After eating it would be wise to explore the vessel, you can use those mini maps that the cruise line usually gives to you as you board the ship or use the maps around the ship. You’ll find that many of the lounges and public spaces are closed. If it’s the shops then they won’t open until the ship is in international waters and if it’s the show theater you’re wanting to explore then the dancers are usually rehearsing ready to put on an outstanding show for you. All the bars will come to life once the evening approaches. The open decks are usually open so feel free to wander up there and at the same time don’t forget to get some shots of your favorite places. Tip: Remember where your stateroom is, it’s easy to spend most of your first day on the ship looking for it to get back. The evacuation drill is mandatory for all guests so don’t miss it otherwise you may get in trouble afterward or when a real emergency occurs you’ll have no clue what to do. By now you would have gone to your stateroom to check it out for the first time but don’t get too comfortable because once the emergency alarms sound you’ll have to don your life jacket and head on up to the muster stations. And don’t try hiding in your stateroom because your room steward will check it. Tip: Don’t take any food or drink, the crew will ask you to dispose of it. Once the drill is over most passengers would have already had their luggage delivered to the stateroom. So unpack as fast as you can so you don’t miss the sail away. Or just leave until later as you’ve got a cruise ship to enjoy! If you have the right kind of luggage with good cruise luggage tags it will be easier for the stewards to delivery to your cabin. The ship sailing out of its homeport signals the beginning of the voyage so the best way to experience it is to head up to the open decks to watch the ship sail away. Usually, the captain will activate the ships horns which can give you goosebumps at times. The ships staff will often put on some sort of sail away party or activity while departing the port. Tip: Make sure your camera is ready for the sail away, it will make the start of your cruise and it’s a view you won’t want to miss. In the evening it’s time to try out all the bars and at least one dining venue. We suggest you try a different restaurant each night so you get to experience everything. It might be worth asking the bar staff about the all-inclusive drinks package and depending if you’re a drinker it could save you money. Also, check any all-inclusive packages before you book your cruise. The ship will come alive at night with every public space open and check the ships activity timetable so you don’t miss any shows. Different venues will offer a different style of entertainment and you’ll be surprised how good the entertainment staff is. Remember not to do too much on the first day, just take it easy and relax otherwise you’ll need another holiday to recover from the cruise!